I am not sure what my hair type is right now, but I am thinking that it is a 4b or 4c. It is so hard for me to get any curl definition. You see this picture on the left? That’s what my hair looks like after a braid or twist out. I used to have nice curls when I was a little girl, but now I cannot see them. My hair stays the same after I use the Eco-styler gel. I use the clear gel with no extra virgin olive oil. 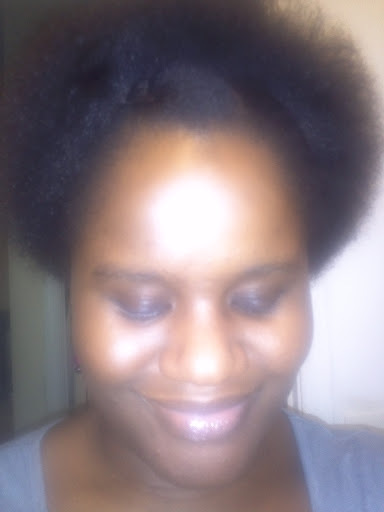 A lot of 4b sisters can do wash and go with Eco-styler gel, why can’t I do it? I am not sure if my hair stays that way because of the multivitamins that I take, or because I do not wash my hair as often as I should. I wash my hair once a week and co- wash once a week as needed. I take nature’s bounty: hair skin and nails, which made my hair very strong and silky when it was relaxed. I am not sure if it contributes to my hair being so thick. I also used Giovanni direct leave-in conditioner, which is supposed to make my hair soft and hold the curls at the same time, but that is not working either. Don’t get me wrong! it is a great product and works well on my daughter’s hair. I hope I find the reason why my hair is like that one day.